UCD was created to address concerns about safety and cleanliness within the district, and our Clean and Safe programs have been critical to our work in the neighborhood ever since. To honor the legacy of our fundamental work, we've chosen to kick off our 20 Years, 20 Stories series with an interview of two remarkable people who have been with University City District since its inception. Debbie Ross and Janet Walker have worked together as part of UCD's Public Space Management (PSM) crew for twenty years, and it shows: the two women finish each other's sentences, laugh in stereo, and have enough love for each other outside the workplace that they've watched each other's children grow up. If you live in the neighborhood you might have seen them sweeping, operating an All Terrain Litter Vacuum (ATLV), or collecting trash. Janet works along 40th Street, and you'll find Debbie on Baltimore Avenue near Cedar Park. 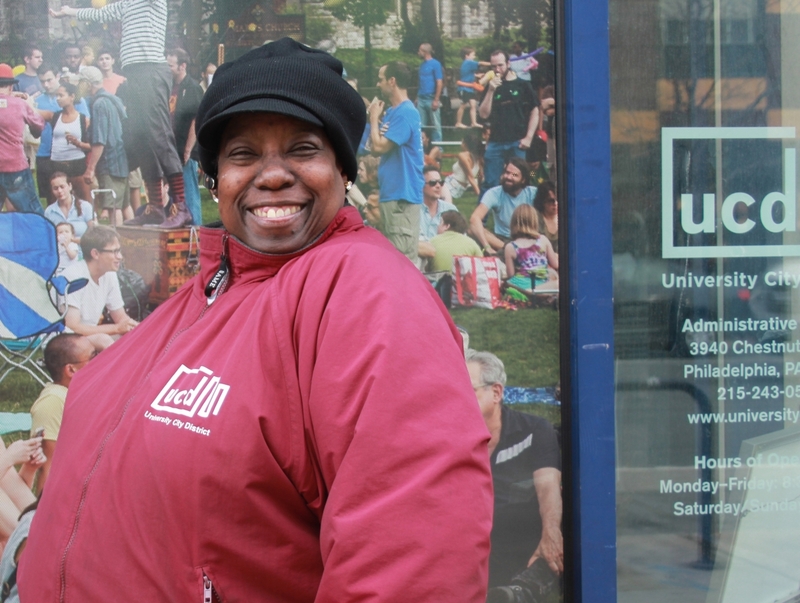 Janet and Debbie are two members of a 20 person crew that works seven days a week, from 8 a.m. to 4 p.m., to clean more than 160 University City blocks. Their uniforms--originally navy blue, then green and gold, and now maroon--have changed over the years, but their commitment and smiles remain the same. "We started on the same day," Janet explains. "August 11th, 1997." The two women were training for another position with ABM Janitorial Services in Center City when a supervisor asked the group if anyone lived in West Philadelphia and was interested in a job working outdoors. Janet, a lifelong West Philadelphian who grew up around 44th and Market, jumped at the chance. Debbie, who had moved to Westpark a year earlier and loves the outdoors, decided to give it a try too. They trained in Center City for two weeks and then joined the UCD cleaning team. Debbie laughs at the memory of the early days. "When we started, some of the smaller streets? I didn't even know they had pavement because of all the stuff on top." Janet agrees. "When we first started and people saw us cleaning, they loved it. They were like, 'Wow, there's really somebody out here cleaning?'" "They were surprised and thankful. They still are!" Debbie says. The women both describe the crew as a family. "If it's a family, then we're like sisters," Debbie says. She's a grandmother of seven, with an eighth on the way. Janet's job with UCD allowed her to put her son through college. He still lives in the neighborhood and works as an accountant. Janet and Debbie have seen transformations in the neighborhood during their time working with UCD. Buildings have risen, restaurants have opened, an influx of new neighbors have moved in, but through it all UCD's core commitment to making the community cleaner and safer has remained constant. "UCD does good work," Debbie says. She's particularly a fan of Green City Works, our landscaping social venture team that she sees planting flowers along Baltimore Avenue. She thinks the whole Clean and Safe program has been great for the neighborhood. "It's picked the neighborhood back up," she explains. She's seen people move back who left years ago. And Janet's favorite part of the job? 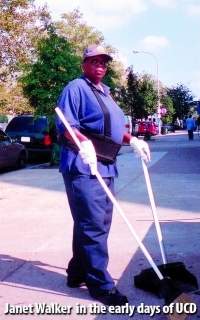 "I like to see the smiles on people's faces when we come out there and do our jobs," says Janet. "People come out and say they appreciate our work. I love doing what I do. I love to make people happy." When considering the twenty years they've worked together, Debbie can't help but smile. "20 years," she says and laughs. "I'm proud of us both for staying here for so long." "I hope we can stay for another 20 years," Janet adds. The rest of us here at UCD hope they can too.